Can I Trade In My Home? Jenny Linich understands that buying, selling and investing in real estate is more than a transaction: It’s a life-changing experience. Jenny has experience in all aspects of residential real estate with an emphasis in new home construction. As a first time home buyer who usually does most things in blissful ignorance, I was completely unprepared. Jenny had nothing but patience for me as she introduced all of the tasks, requirements, laws, and scenarios to me. She listened to my requirements and helped me find homes in my scope. She chased me down when I was getting sidetracked and made sure I was comfortable each step of the way. Its safe to say that without her I’d probably still be living the apartment life. I look forward to friends or family in the market in need of a realtor so that I can give them her card. My association with Jenny Linich has been extremely positive. She not only found the perfect place for me but also did the same for my son. Each transaction went so smoothly with little or no problems, all because Jenny had everything lined up perfectly. Not only is she a very intelligent agent, she is also good natured and a pleasure to be around. She helped through each transaction with efficiency and good humor. I have recommended her to someone I know who is hoping to sell her property and purchase another after the first of the year, and will certainly spread her name around to those I meet here. "We want to take this opportunity to thank you for all the time and work you have put in to help us both sell our home and get our new one built. It was due to your excellent marketing that we were able to sell our home in only two weeks, and at full price. Never in our dealings over the past 20 years has anyone been so professional and efficient. Also, your continuous follow through and assistance on the building of our new home has really taken the stress out of this procedure. We have been able to depend on you for all the large and small details that have come up and without your assistance, this would not have been possible. Again, thanks to a real professional for all you have done." To find a realtor that makes you feel like family and not just a client is a rarity! Jennyʼs professionalism, efficiency, and natural graceful interactions are purely amazing. Iʼve never experienced a realtor so motivated, energetic, willing and able to pull magic out of a hat as Jenny has done. She is simply remarkable in that she is able to cover all of the bases, all the time, and make it look effortless. Any time I would call with a question, any question, no matter how silly, Jenny answered with confidence. What she does, the way she does it, you canʼt learn, it comes naturally. She not only has a gift, she is a gift. We could never thank her enough, and would highly recommend her to everyone for their reality needs. 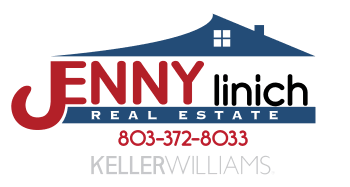 "When my wife and I were searching for a real estate agent in Fort Mill, SC when we came across Jenny Linich and found her website to be extremely helpful. A few words that I use when describing Jenny are: trustworthy, honest, and knowledgable about the market. She goes out of her way to know all of the details about every new builder in York County, SC. Considering all the realtors I have dealt with in my life, I have to say that Jenny Linich was the smartest and most informative throughout the purchase of our new home. She ensured we got the right home for our family. She even helped us know which builders and neighborhoods would be a bad fit for us. Jenny truly listened to our needs and provided us with all the information we needed to make our new home purchase." My wife and I had the pleasure of Jenny being our agent. One year before we got married and before we were truly ready to buy, Jenny took the time to sit with us and educate us. She was absolutely amazing and knowledgable. We spoke to a least 3 other agents in the area and they all turned us down because we were "Not exactly ready to buy". When we were finally ready we couldn't image have anyone else in our corner. We will continue to partner with Jenny for our future real estates needs and would highly recommend her to anyone. Updated: 31st January, 2018 8:23 PM.